My son, the now avid foodie, let us know early on (at four months, to be exact) that he was more than ready for solids. It so happened that his desire to start eating solid foods coincided with our summer vacation in Italy. While I was already somewhat apprehensive and confused about the food introduction process (as most first-time moms are) I was also in a foreign country, where different rules applied! While I was keen on following the North American method, I quickly discovered how different the Mediterranean approach was to introducing solids…and I liked it! The Italian approach differs from the North American one in that the main meal (lunch) revolves around a staple ingredient, broth—whether it be vegetable, beef, or chicken. The important thing is that it is homemade and included in baby’s daily diet. At first, I couldn’t wrap my head around this notion, since I was only familiar with what North American pediatricians and experienced mothers alike had told me; rice cereal, then veggies and fruit, onto meats and poultry, etc. While Italian pediatricians also recommend starting with different types of cereal, they serve them in a typically Mediterranean fashion—that is, with broth. Once baby is over mushy cereals, they can start eating “pastina” (tiny soup noodles), then move on to bigger ones as they grow. As the saying goes, “When in Rome, do as the Romans do,” so I quickly adapted to the Italian mentality and found myself preparing fresh vegetable broth for my son regularly. And of course, I always added a drizzle of extra virgin olive oil (which aids in digestion) and freshly grated Parmesan (for a salty bite without adding sodium) just to spruce it up a bit! Store broth in the freezer in single portions (such as in baby cubes) for quick access. Purée veggies with the broth for a thicker consistency. Remove veggies, mash or purée, and freeze separately. Serve veggies with proteins for a healthy “side” dish or mix with whole grains. 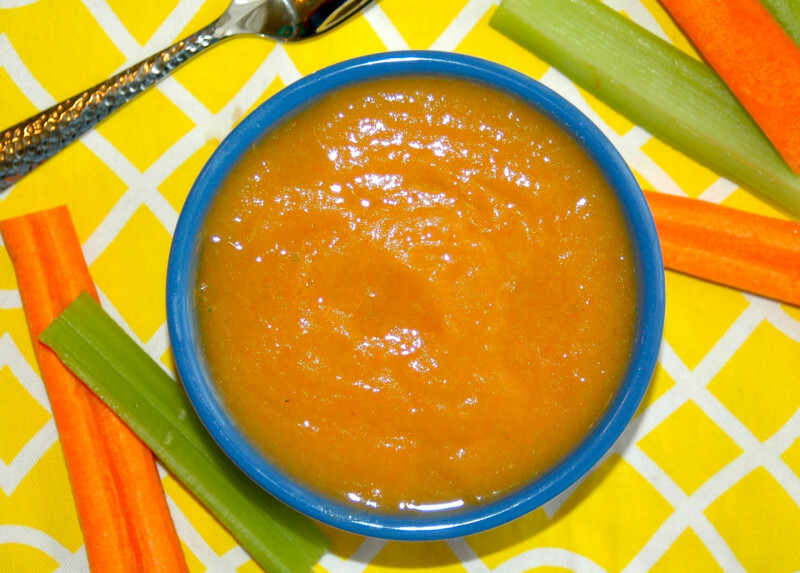 Add broth to reheated baby food to add moisture and soften food. Substitute water with broth when boiling veggies or preparing rice or pasta for additional flavor. Follow the Italian way to introduce your bambino to solids! Step 1: Prepare veggies, then add to a large pot and cover with water. Step 2: Bring to a boil on high heat. Once boiling, reduce heat to medium-low and cook uncovered for 25-30 minutes or until the veggies are fork tender. Step 3: Garnish with a drizzle of extra virgin olive oil and freshly grated Parmesan, if desired. *Ingredients do not need to be exact portions as long as enough water is added to the pot to completely cover all the veggies. You can also personalize the recipe by adding your favorite seasonal vegetables, such as zucchini, green beans, Swiss chard, sweet potatoes, etc. Lisa Codina is a working mom, fitness fanatic, recipe developer, and self-professed foodie. She is the author of Baby Bites: 50 Healthy Recipes for Baby and the Family and the founder of the Blog Bites for Foodies, where she shares clean eating recipes for the family and blogs about daily life with her Italian husband, two mini foodies, and summer vacations in Sardinia, Italy. She prides herself on providing her family with nutritious meals that focus on clean eating (i.e., gluten/dairy/refined sugar-free) that nurture adventurous palates and encourage a healthy lifestyle. You can also find Lisa as Bitesforfoodies on Instagram, Twitter, Facebook, and Pinterest.